REM is all about teams of volunteers joining hands to work on quality of life issues in our community. The team model reflects REM’s focus on collaboration, consensus building, the high value placed on the richness and strength our diversity brings to an issue, and the spirit of love…love of each other, love of a commonly held vision, love of our dreams and love of the power of community. The REM Umbrella is the symbol we use to describe the two types of REM teams. 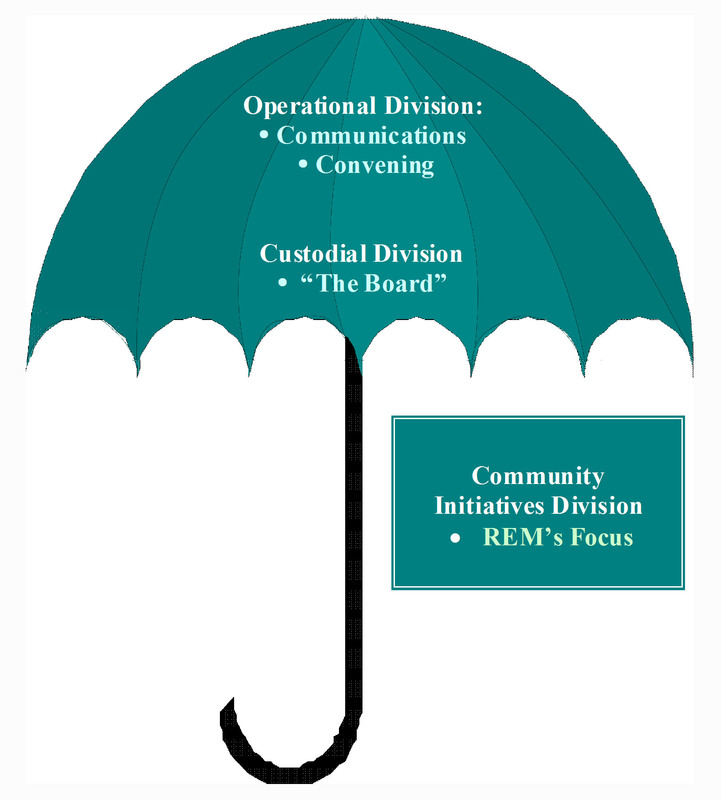 Under the REM Umbrella - The focus of REM is the Community Initiatives...projects created and managed by area citizens to help create a community where people thrive as described in our commonly held Mid-Maine Strategic Vision for the Year 2020. Of the REM Umbrella– Volunteers are often busy people. All projects have certain commonly held needs such as communication tools, meeting spaces, equipment, and often, food. Some volunteers give of their time and talent to support the work of the Community Initiatives by providing these services for teams that need them. Communications: Support teams focusing on specific needs REM has to help teams communicate with each other and the community at large. Convening: Support teams focusing on specific needs arising when convening meetings or events. "The Board": Support teams providing organizational structure, process, funding and leadership under the management of the REM Board.